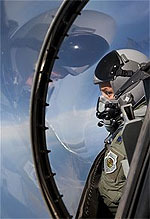 For the past half century, fighter pilots have dominated high-level leadership roles in the Air Force, much as bomber pilots did during World War II and the Cold War. But a recent study from the Rand Corp., sponsored by the Defense Department’s Office of Net Assessment, questions whether that hierarchy — with fighter pilots first, bomber pilots second and other specializations after — continues to serve the best interests of the service, especially in terms of fostering innovation. The Puerto Rico Air National Guard, or PRANG, has lost its flying mission less than two years after Hurricane Maria battered its main base and nearly a year after tragic accident exposed a culture of apathy and poor morale. It will now reorganize its former flying units to support the U.S. Air Force’s recent push to revitalize its ability to rapidly deploy and establish forward bases overseas during major crises and conflicts. Details have emerged of an incident early this year during which a Lockheed Martin F-16AM from the Royal Netherlands Air Force was damaged by its own gunfire during a training flight. The 21 January mishap involved a formation of two Dutch F-16s using their M61A1 20mm cannons during a practice strafing run, firing at a target on the Vliehors range located on the island of Vlieland. The radar wake of a Japanese F-35A stealth fighter disappeared over the Pacific Ocean about 73nm (135km) east of Misawa air base on 9 April at 19:27 local time. The Japanese military has commenced a search mission for the aircraft and its single pilot, though the country’s air force offered no details on suspected causes of the disappearance. The Lockheed Martin F-35A was engaging in night-time training with three other F-35A jets, according to The Japan Times. Poland believes it can accelerate the purchase of up to 32 Lockheed Martin F-35 combat aircraft, following suggestions that the USA is willing to expand the fifth-generation jet's operator base. In written testimony to the US House of Representatives, Vice Admiral Mat Winter, director of the Joint Strike Fighter programme, indicated that the Department of Defense was considering sales to countries including Greece, Poland, Romania and Spain. Group Captain Samrath Dhankhar of the Indian air force has earned a place in aviation history, as the commanding officer of its 45 Sqn (“The Flying Daggers”): the first to operate the Hindustan Aeronautics Tejas Mk1 fighter. The Air Force awarded the Gallant Unit Citation to the 74th Fighter Squadron out of Moody Air Force Base, Georgia, March 14 for its combined actions during close-air support missions against the Islamic State group in Syria. The squadron struck more than 44 percent of targets in the Operation Inherent Resolve theater over the course of 181 days with only 12 aircraft beginning in the summer of 2017, according to the unit citation. Germany’s renewal of an arms embargo on Saudi Arabia effectively casts doubt as the lead partner for France to build a future fighter jet, drone, and tank, key projects to boost consolidation in the European defense industry. Berlin on March 28 extended by a further six months a ban of the sale of weapons to Riyadh. German imposed that sanction last October in the wake of the slaying of journalist Jamal Kashoggi by Saudi officials in Turkey. The Indian Air Force (IAF) is looking to purchase 21 Russian MiG-29 jets to address the shortfall of combat aircraft in a deal estimated to be valued at $900 million (INR 6,300 Crore). “The airframes are ready and Russia has promised to deliver all 21 fighters within 18 months,” a senior air force official was quoted by Hindustan Times as saying Thursday. Russian Helicopters has completed preliminary flight tests of the new Mil Mi-26T2V helicopter, pending its handover to the Russian defence ministry for joint evaluation. The rotorcraft first flew in August 2018, and testing has been conducted from the Mil Moscow Helicopter plant. Russian Helicopters says the Mi-26 is the world’s largest helicopter, with a maximum take-off weight of 56t and capable of carrying a 20t payload. Malaysia’s SU-30MKM fighter jets are now almost certain to get a life extension following the launch of a local enterprise to perform deep maintenance on the Russian-made fighter jets. Consequently, a plan to purchase the Dassault Rafale or the Eurofighter, as part of the Multi-role Combat Aircraft (MRCA) project may be delayed indefinitely as Kaula Lumpur grapples with budget cuts and a deepening palm oil crisis with the European Union. The U.S. Air Force is preparing for the next A-10 Warthog contract to re-wing more of the close-air support aircraft. The next contract for the "A-10-Thunderbolt II Advanced-Wing Continuation Kit," known as "ATTACK," is going through source selection and is expected to be awarded this fall, Air Force spokeswoman Ann Stefanek said Monday. The service has $267 million set aside to buy "about 20 total wings," she said. Malaysia is said to be considering purchasing JF-17 Thunder fighter jets from Pakistan following Prime Minister Mahathir Mohamad’s visit to Islamabad last month, according to reports. Mohamad was Prime Minister Imran Khan’s guest of honor while on a state visit as he watched the Pakistan Day military parades and celebrations. US Air Force pilots and maintainers at Hill AFB in Utah completed the first operational hot crew swap exercise with the Lockheed Martin F-35A Lightning II. Also, called a “rapid” crew swap, during the operation a pilot takes off, completes his mission, lands and refuels the aircraft, while another pilot takes over the cockpit of the same fighter. The process cuts down on the number of required maintenance activities and reduces the time it takes to launch new sortie by up to 2h, says the USAF. The US State Department has cleared the sale of 24 Lockheed Martin MH-60R anti-submarine warfare (ASW) helicopters to India. The deal is work $2.6 billion and follows a request from New Delhi for the acquisition, says the Defense Security Cooperation Agency (DSCA). The Republic of Korea Air Force (ROKAF) has received its first pair of Lockheed Martin F-35As in South Korea. Seoul’s Defence Acquisition Program Administration (DAPA) confirms that the two aircraft arrived on 29 March, landing at Cheongju air base at 14:00 local time. The US Air Force suspended deliveries of Boeing KC-46A Pegasus tankers for a second time in about a month on 23 March after discovering foreign object debris (FOD) inside the aircraft. The service previously halted delivery of the refueling tankers on 20 February after FOD, including forgotten tools, were discovered inside the aircraft’s airframe. China says it will buy Russia’s advanced Su-57 stealth fighter in a move that will further cement the nation’s status as a rising world superpower. The Beijing controlled Global Times reports Moscow has released the advanced new fighter jet for expert in a bid to attract scarce foreign currency. Spain plans to purchase two General Atomics Aeronautical Systems MQ-9 Block 5 Reapers for $34 million via the US foreign military sales process. The acquisition also provides for associated equipment, presumably ground control stations, spares and support equipment. The unmanned air vehicles are expected to be completed by 31 March 2020, according to a US Defense Department contract notice online. Saudi Arabia has rolled out the first of an eventual 22 BAE Systems Hawk Mk 165 jet trainers to be locally assembled. Unveiled at King Abdulaziz air base by Crown Prince Mohammed bin Salman, the indigenous manufacturing effort is part of the country's Vision 2030 strategy to grow its defence sector. Advanced air forces around the globe are often highly technologically dependent, considering the sophistication and complexities inherent in aerospace technology. These complexities are often surmountable through painstaking efforts of many years of unbroken research and development, with huge financial burden on the nation and its citizenry. The sacrifices may seem grave but the benefits are no doubt greater. The Pentagon's annual budget request is a shopping list featuring some of the most sophisticated, cutting-edge technologies available on the planet. But one item that stood out in this year's request was the military's embrace of a 1960s-era fighter jet that the Air Force said it intends to acquire in significant quantities in the years to come. A pair of Marine Viper pilots were killed Saturday night when their helicopter crashed in Arizona, Marine officials announced Sunday. The crash occurred near Marine Corps Air Station Yuma at about 8:45 p.m. local time, according to a statement from base officials. The pilots were flying an AH-1Z Viper helicopter. A MiG-27 UPG aircraft of the Indian Air Force crashed on Sunday morning here. The pilot managed to eject safely. The aircraft was on a routine mission. Notably, MiG-27 UPG is upgraded versions of the aircraft. Indian Air Force now is now left with the last squadron of the Mig-27 UPG, according to reports.